“Mourad created both beautiful and horrifying projections on the back screen of the stage and also sat at a computer projector producing fluidly morphing images on a scrim: people floated about; ancient buildings melted; and complex landscapes passed by capturing the mood of the choreography. Dressed in Tyler Holland’s perfectly realized drab, pale blue costumes, the cast did the impossible: they molded dance and art into a dramatic whole to catch the devastation and horror of the current flood of emigrants out of Syria and other Middle Eastern countries. In a stylized, yet effective way, the work caught the political and physical abuses they suffered, all the while making it clear that their spirit and grit kept them pushing onward to unknown destinations. Somehow, the research of the dancers—and the presence of real, live political refugees in the company—gave them the intimate knowledge to portray these unnamed masses. Healthy, good-looking dancers morphed into living, breathing metaphors. 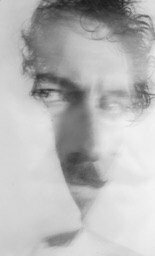 Kevork Mourad was born in 1970 in Kamechli, a town in the upper reaches of Syria. Of Armenian origin, he received his MFA from the Yerevan Institute of Fine Arts in Armenia, and he now lives and works in New York. With his technique of spontaneous painting, where he shares the stage with musicians—a collaboration in which art and music develop in counterpoint to each other—he has worked with many world class musicians. He now implements that same technique with dancers in Battery Dance’s “On Foot”. He is a member, as a visual artist, of Yo-Yo Ma’s Silk Road Ensemble. He has performed at the Brooklyn Museum of Art, the Chelsea Museum of Art, The Bronx Museum of Art, the Rhode Island School of Design, the Chess Festival of Mexico City, The Armenian Center for Contemporary Experimental Art in Yerevan, Le Festival du Monde Arabe in Montreal, the Stillwater Festival, the Nara Museum in Japan, the Art Institute of Chicago, the Rubin Museum of Art, Harvard University, Lincoln Center Atrium, the American Museum of Natural History, the Metropolitan Museum of Art, National Sawdust, and Central Park’s Summerstage with the Silk Road Ensemble and Bobby McFerrin. Mourad’s most recent performance with Kinan Azmeh, “Home Within”, has been touring Europe and North America for the past two years. 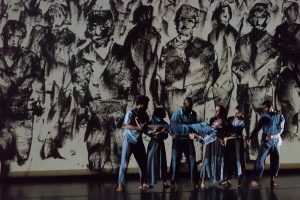 “On Foot” was Kevork’s first collaboration with Battery Dance. For more information on Kevork Mourad, please visit his website.